There may be close to a dozen brands of quality wood lathes in the market today. To select the best one, it requires a considerable research and some forms of actual handling the equipment themselves. Since it is not a practical way to test all the available types and models of wood lathes to ensure a right choice, it would be a good idea if you visit furniture factories or any woodworking establishments or facilities to find out the best wood lathes in 2019. Try to talk to the manager and persuade him if you can get a glimpse of how their wood lathes work. Chances are, they would not object to your request most especially if you buy a few pieces of their products as a reciprocating gesture of courtesy. Wood lathes come in various types or shall I say, various functions depending on the woodworking projects that you have. Essentially, most wood lathes are used in wood turning applications to create objects or items which are cylindrical in shape and require symmetrical sides such as baseball bats, pool cue sticks, candle holders, newels, tool handles, chess pieces, furniture legs and many more. To find the top wood lathes, you need to know first what kind of work you want to accomplish. Although most wood lathes can be used whatever wood turner jobs you have in mind. 2 What is a wood lathe ? What is a wood lathe ? A lathe is a vital tool for anyone interesting in trying woodturning as a hobby or to branch out your existing DIY skill set. These ingenious tools have been around since the days of the Ancient Egyptian Empire. Originally they consisted of 2 sides that held the wood in place. One person turned the wood using rope, while the turner himself cut the shapes into the wood using a sharp tool. 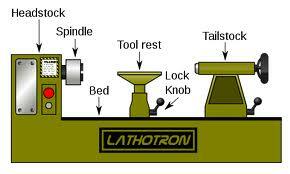 Today’s lathes are to some degree automated and made from either cast iron, steel or a combination of the two. The turning is motorised, but the basic design and look owes a lot to the ancient varieties and still holds the wood between two sides. If you are new to lathes, then you may find that buying your first one is a tricky job. Don’t despair as we will look at 3 main things to consider when you are looking for the best lathe for you. You can also look at our lathe reviews where you can read expert opinions on different types, as well as read about other peoples experiences. It is important to decide at this point what you want to use a lathe to turn. If like many people you want to turn writing pens and pencils and similar small items, you should opt for a machine big enough to handle those jobs and nothing bigger. Whereas if you intend on getting adventurous and want to try larger items like salad bowls, table legs, lamps and even quirky wooden hats, you will need a larger machine. The size of the woodworking lathe directly relates to the size of the piece of wood it is capable of holding and turning. 12 by 36 is the most common size on the market, which means it can hold a piece of wood with a maximum diameter of 12 inches and maximum length of 36 inches. Imagine how frustrating it would be to want a particular accessory only to find that it is not available in a size compatible with your wood turning lathe. The main two sizes you should be looking at with regards to accessories are the head and tail stock tapers and the head stock spindle thread. The thread size for beginner lathes is most commonly 1 by 8 inches tpi, along with 3/4 by 16 inches tpi models. A large number of accessories are available for machines of these sizes. Spindles and Morse taper, sized together that is compatible with many different accessories. It is best to look for one with a number 1 or number 2 tapers. As well as finding one that is the right size and is compatible with the accessories you need, you also need to consider the variable speed wood lathe. If you are looking to turn candle sticks, pens or chair legs you will require a higher speed than turning salad bowls. Either electronic or mechanical speed drives or moving belts along pulleys usually adjust the turning speed. The former is more expensive, but either work well enough. Much more important than the adjustment process, is the adjustment range that really matters. For a beginner you should be looking for a low level of 600 rpm and high level of 2000 RPM. Hopefully this guide will help you find your first lathe. Be warned that once you get into woodturning you won’t be able to stop. OK, so now we’re going to be listing the features that a good lathe will come with. This should be a good learning experience for people who are new to lathes, and the products we’re listing are good for both newbies and seasoned professionals alike. So let’s get going with this buying guide. The motor horsepower of your lathe will determine the abilities of the lathe itself. A stronger motor can knurl, sand, and drill harder materials and won’t bog down in the middle of wood working. You should look for a motor that’s between 1/2 and 2 horsepower. The RPM speed should be between 1,500 and 5,000 RPM. This provides an adequate spinning speed that’s capable of a great variety of project types. The motor on your lathe should be variable speed wood, allowing you to change the speed. The motor should be able to power through your jobs without bogging down or breaking. The ability to lock your lathe into place for specific angled cuts will allow you to make precise angled round shapes with your lathe. Look for detents that lock into place for easier use. This can help your lathe last a lot longer than plastic construction. Unless your lathe is a mini-size, you should opt for an all cast iron construction. Not only is it worth more, but you’ll be surprised by the durability. The bed of the lathe especially should be made of cast iron for increased strength. An RPM readout makes it easy to keep track of the speed that the benchtop lathe is spinning at. Specific RPM speeds are needed to cut certain material and to make the best possible angled cuts. Look for RPM readouts on any lathe that you consider purchasing. Amazon Review Score, Manufacturer, And Warranty The Amazon review score of the lathe you’re considering can tell you a lot about the quality of the product. Only opt to purchase a lathe that has at least a 4 star rating. Secondly, some great manufacturers of lathes these days are Jet, Powermatic, and Delta. These are all solid companies to buy from. Lastly, the warranty should be long enough to protect you from any possible defects from the factory. Remember, midi lathes and mini lathes are very similar. They’re both very compact and don’t take up a lot of space. The mini or midi lathes may not be as full featured as a full size lathe, but it all depends on what you really need. The Rikon 70-100 makes our choice for the best mini wood lathe. The tool has a big strength of versus the rest of its competitors in this category. This biggest strength of the Rikon 70-100 is the extra 2 inches of swing over the bed. These two extra inches will go a long way in terms of the flexibility when you have to work on larger wooden pieces. The Rikon 70-100 is the heaviest from the three top choices and also has the best reviews. A heavier tool it’s a good indication of quality construction and quality materials. The Rikon brand name has a good reputation on the market and the Rikon 70-100 model has a 12 position index head that gives it more flexibility and convenience in your wood jobs. The Excelsior 5-Speed tool from Rockler can spindle 17-3/4 inches in length and turn items of 10 inches in diameter. These specifications are making Excelsior 5-speed a perfect choice for wood lathe with legs of small tables and chairs, and an endless array of decorative items. The five speeds of 3200 RPM, 2200 RPM, 1600 RPM, and 760 RPM gives it great versatility in your choice of wood jobs performed with this too. Excelsior mini lathe comes with a convenient door that gives users easy access to the belt. Its cast-iron body provides enough mass for maximum durability, stable turning, and minimal vibration. In order to increase the capacity of your spindle to 38-1/2 inches, you can use an optional bed extension. The Excelsior 5-Speed tool is powers by a 1/2 HP motor. Among other features this mini lathe comes with chrome plated hardware. The 6 inches tool rest on 3 inches face plate. This tool is versatile and easy to use. For safety during your wood jobs the tool features a removable safety switch. The Fox W1752 mini lathe comes with quick access speed changes, tailstock travel on 3-1/4-inch, swing over bed of 10 inch, and tool rest length of 6-1/4 inch. The mini wood lathes includes live rolling center, 3 inch face plate, tool rest, and spur center. The 1/3 HP motor and 8″ swing on this lathe can be a limiting factor in what projects you can use it, and for this reason the Fox W1752 occupies the third place on our review. However, if you’re interested in just small wood pieces such as pen turning, this model can offer you the best value for your money. Another advantage to Shop Fox W1752 is the fact that this tool comes in at almost half the price of other tools on this list. For a cheap wood mini lathe model, W1752 has a great features list. The variable speed wood lathe control and the iron construction stand out among its features and at this price point will be hard to find anywhere else at the competitor models. 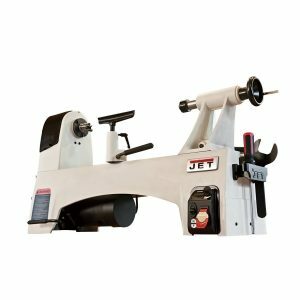 If you are looking for a portable or benchtop wood lathe, your best choice is one of the mini lathes on our list. Whether for turning intricate designs in artwork or for small home projects, these three top mini wood lathes on the market can help you have the job done. There are a number of things to consider before you purchase a mini wood lathe for home projects. We’ve listed here the best mini lathes that show off the best versatility, specifications and features, according to user input and our personal experience. If you are looking for a mini lathe for intricate small wood projects, you want a lathe that offers the versatility you require and the freedom of motion you need. Each model on our list has its own pluses and minuses, but based on power and versatility our top choice is the Excelsior 5-Speed tool from Rockler.